Get started with Nutritional Analysis for your restaurant’s menu. 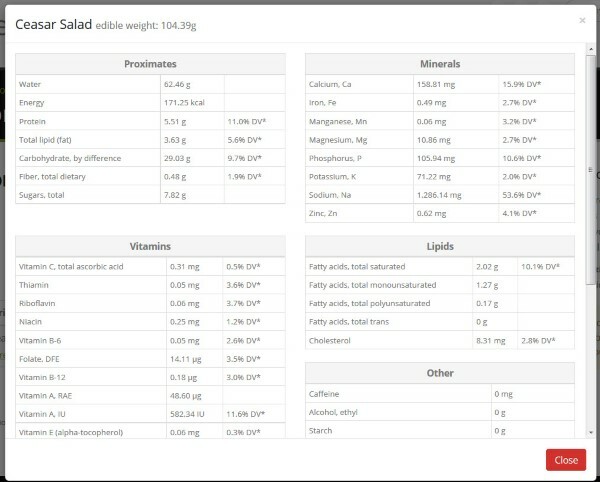 OpenMenu provides one of the most accurate cloud based nutritional analysis tools around. You select from over 9000 ingredients and we use our 700,000 nutrients to quickly create powerful reports for you and your customers. More and more customers are looking for nutritional information for restaurant menus and OpenMenu makes it easy, and affordable, for restaurants to generate nutritional labels for customers and nutrient reports for themselves. What does a restaurant get? We provide restaurants with comprehensive, detailed nutrient reports. These reports are provide to the restaurant only and give access to grouped details on the nutrients for your menu item. Grouped by nutrient types and includes the nutrients, value and the percentage of daily recommended value. What do the restaurant’s customers see? 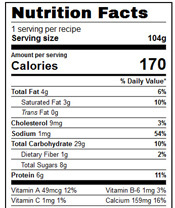 Customers will get access to nutritional labels generated inline with the FDA labeling guidelines. How hard is it to add a recipe? It’s a simple 1-2-3 process. All you do is attached ingredients to a menu item, we do the rest. ← How is Your Restaurant’s Menu Performing?